Aviatsionnaya Street in the north-west of Moscow once was a central street of Pokrovskoye-Streshnevo village. 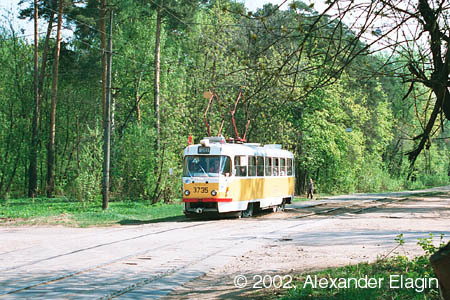 First trams came there long ago - in 1922, when this area was far from Moscow city limits. The line was expanded in 1938, but most part of this extension was closed in 1975. 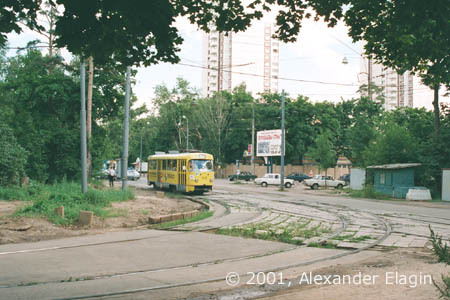 A large old terminus in Pokrovskoye-Streshnevo, however, existed for long years serving as a training site for tram drivers from all around Moscow, but finally it was abandoned and completely destroyed in the middle of 1980s. Today, a large hospital occupies the space where the loop had been. A crossing of Aviatsionnaya Street with Akademika Kurchatova Street. 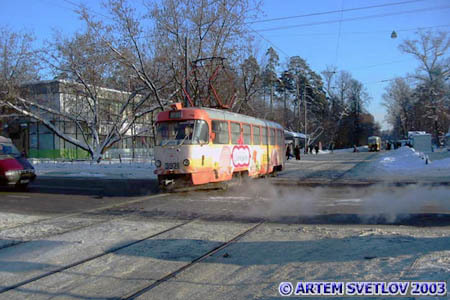 The line branches a few metres from the crossing with Akademika Kurchatova Street. The main line continues along Aviatsionnaya Street while the branch goes to Tushino district. 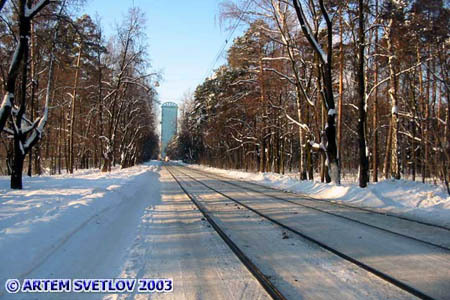 A winter view of Aviatsionnaya Street with a new residential tower in the horizon. Tramstop Dispanser is located at the crossing of Aviatsionnaya and Vindavskaya Street. 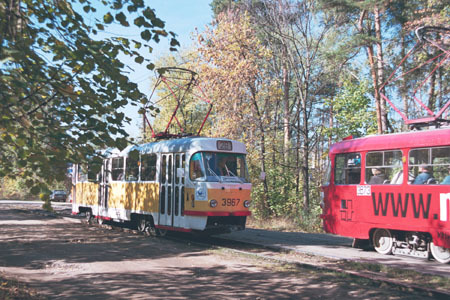 The latter was named after Vindava (now Ventspils) city in Latvia; there is a railway line connecting Moscow with that city not far from this street (just beyond the forest to the right). The crossing of Aviatsionnaya and Vindavskaya streets. Both roads have a very low motorcar traffic, if any; not a common situation for today's Moscow. 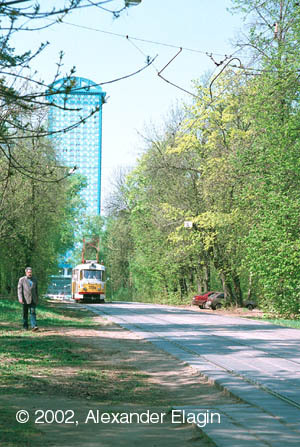 This is the place that the old Pokrovskoye-Streshnevo terminus had been. The last part of Aviatsionnaya Street with tram tracks has a steep grade to the square near Shchukinskaya metro station. While tracks there turn to Novoshchukinskaya Street en route to Strogino and Zhivopisnaya Street, Aviatsionnaya Street continues further to the bank of Moskva river. That short stretch once had had a tramline but it was closed down and lifted in 1975 during the construction of metro line.